His power: Quicksilver can move at supersonic speeds. The world slows down around him when he taps into his mutant ability, allowing him to maintain his perception and reflexes even though he’s going really fast. His story: Quicksilver is the son of Magneto, but Magneto doesn’t know that yet. The young speedster debuts in X-Men: Days Of Future Past, where Wolverine, Charles Xavier, and Hank McCoy approach him to help break his father out of federal prison. Wolverine and Peter’s older self have an undisclosed past relationship, and Logan is confident that the hyperactive thief is just who they need to achieve success. Quicksilver frees his father from his glass cell underneath the Pentagon, and in the most imaginative, exciting sequence of the entire X-franchise, Quicksilver takes out a squad of armed guards at superspeed while listening to Jim Croce’s “Time In A Bottle.” Quicksilver then exits the movie’s plot, though he is shown watching his father’s attack on the White House on television with his mother and younger sister. Peter searches for his father in the decade that follows, and he heads to Xavier when the trail goes cold in X-Men: Apocalypse. He saves all the students in a scene that tries to recapture the magic of the “Time In A Bottle” sequence with The Eurythmics’ “Sweet Dreams,” and is then captured by William Stryker. During his imprisonment, Peter reveals to Mystique that Magneto is his father. He fights alongside the X-Men after being saved by some members of the new class and works with Mystique to take down Magneto when the team goes up against Apocalypse and his four horsemen. With the threat of Apocalypse eliminated and the X-Mansion rebuilt, Peter decides to officially join the X-Men, giving up his life of rebellion to become a mutant hero. 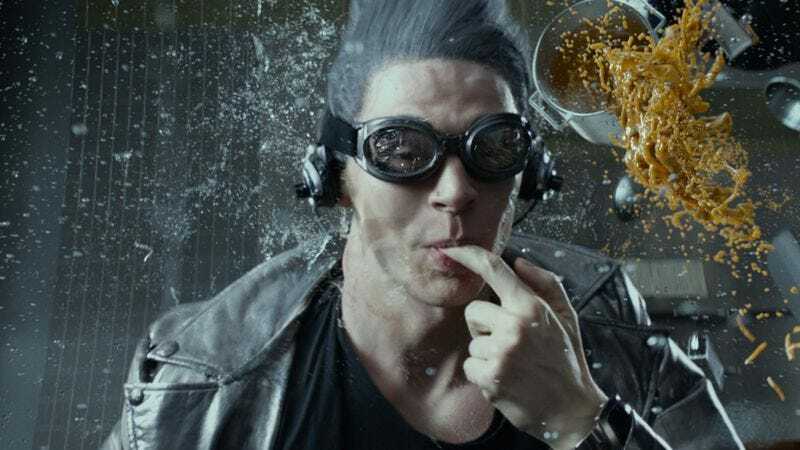 Currently, Quicksilver is: A member of the X-Men and committed to eventually telling Magneto about their biological connection. Where will we see him next? Quicksilver will most likely appear in the next X-sequel, which will take the mutant team into the ’90s.